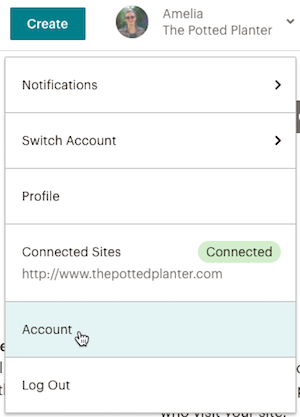 Link multiple Mailchimp accounts to a single login to streamline your account management and easily switch between accounts. This process lets you log in to several accounts with one username and password, while keeping your billing and account data separate. This can be helpful if you use Mailchimp to manage client accounts. In this article, you'll learn how to use a single login for multiple Mailchimp accounts. Only franchises and agencies can create multiple accounts under our Acceptable Use Policy. Decide which account will act as your primary account and which will act as your secondary account. After you finish this process, you'll use the primary account login to access both accounts. During this two-step process, you'll email yourself an invitation to join your secondary account, and log in with your primary account's username and password. Be sure to send the invitation to the email address associated with your primary account. Use this process to link as many Mailchimp accounts as you need. To send an account invitation to the email associated with your primary account login, follow these steps. 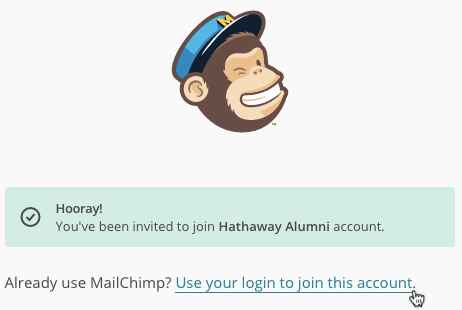 Log in to your secondary Mailchimp account. Click the Settings drop-down menu and choose Users. 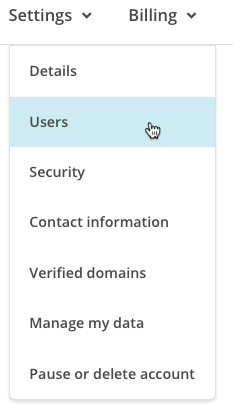 On the Invite a user page, input the email address associated with your primary account login and choose Admin. We'll send an email to the address you provided asking you to join the account. As soon as you receive the email, you're ready to link your account logins. To link your primary account login to your secondary account, follow these steps. In your email client, open the account invitation. On the Login screen, click Use your login to join this account. Input your primary account's username and password and click Log In & Join. Now your account logins are linked. The next time you log in to Mailchimp, we'll ask you which account you want to access. After you log in to either account, you'll be able to switch between them in the Profile menu. Click your profile name, choose Switch Account, and then click the name of the account you want to access. 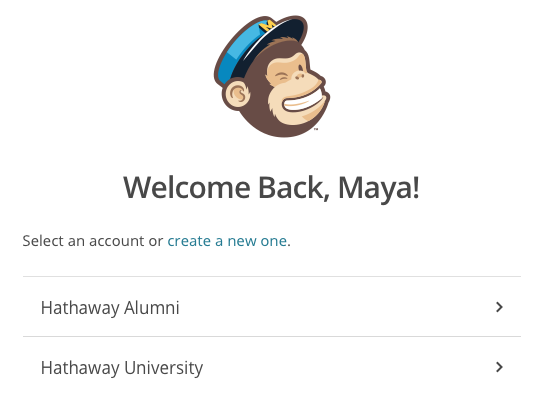 Learn how to consolidate multiple Mailchimp accounts into one single account. Learn how to use Mailchimp's multi-user accounts for agencies. Learn how to transfer account ownership to another user in your account.